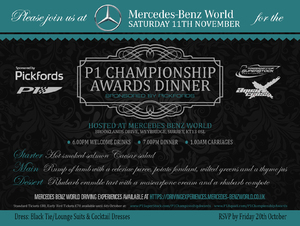 Please join us for the 2017 Championship Awards Dinner hosted at Mercedes Benz World in Surrey, home of the famous Brooklands racing circuit and adjacent to the Brooklands Museum. RSVP by Friday 20th October. You have a chance to test drive the latest models on the circuit and visit the museum prior to the Championship Awards. To book Mercedes Benz World Driving Experiences please click here. These is also an opportunity to gain access to the Mercedes Benz Simulator Zone on the evening of the Championship Awards – please see ticket options for more details. Brooklands Hotel is located around 2-minute walking distance from the venue. Oatlands Park Hotel is located less than 3 miles from the venue. Special offer rates inclusive of accommodation, full English breakfast, complimentary parking, Wi-Fi and VAT. Cancellation policy of up until 2pm the day before arrival. For bookings, either email reservations@oatlandsparkhotel.com quoting ‘Powerboat Event’ or call 01932847242. Hilton Cobham Hotel is located less than 3 miles from the venue. For bookings, either call +44 1932 864471 and quote ‘APOWER’ or visit eventsathilton.com.